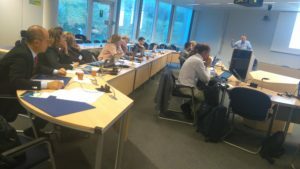 On the 3rd of October the European Commission premises in Brussels hosted the Brokering and Pitching Event, one of the numerous initiatives of the European Commission towards stimulating the entrepreneurship community. The event gathered European projects’ representatives* with a common goal to learn and share the best pitching practices. 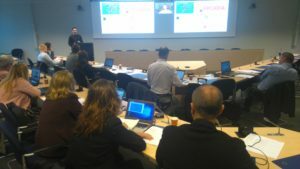 Dr. Ricardo Jiménez-Peris, the CEO and Co-founder of LeanXcale, gave a start to the event by introducing to the participants the goal of the European Commission’s startup initiatives, which is to reach successful market presence of the funded research and technological development projects. He gave a profound review of the initiatives of entrepreneurship unit, such as SME intrument and EIT Digital accelerator program, stating their capabilities to foster the startup creation, establish entrepreneurship culture and help projects scale and bring results to the market. 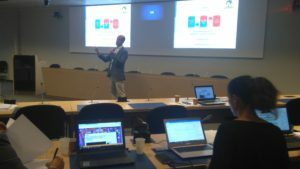 Dr. Jiménez-Peris demonstrated effectiveness of the European Commission initiatives with his own example of transforming his 25-year career as a professor and researcher at TU Madrid (UPM) into a highly competitive startup, LeanXcale. Andrea Di Anselmo, vice president of META, continued the conversation focusing on the topic of pitching research results. Lastly, the participants got a chance to see the real pitches and receive feedback from Emma Fau and Luigi Amati, investors from Business Angels Europe. The Brokering and Pitch Event has proven to be a successful initiative, providing quality insights into the major mean of communication between companies, researchers and investors. The participants gave a positive feedback to the event pointing out that the topic and the content of the event benefited greatly to the ability to communicate the results of their corporate and research initiatives.